Lynn LOVES Marine City because of all of the sports and recreation programs, but most importantly because everybody looks out for each other. That’s why we LOVE Marine City, too, Lynn! Dan Micoff LOVES Marine City because of the boating, the fishing, the food, and the people! We think YOU are fantastic, Dan! I LOVE Marine City because it’s a short commute to work everyday and I get to enjoy the freighters and beautiful water view as I drive into town! Our friends from across the pond, Bob and Barb, LOVE Marine City for the restaurants, the ice cream, and because it is a quaint little town! Thank you for visiting from Windsor, Ontario, Bob and Barb! Erika LOVES Marine City because it is a destination location, and Marine City is closer than you think! Laura agrees! Shannon Schwabe grew up here, and decided to come back to start her business here! What she LOVES most about Marine City is the community. We’re glad you came back, Shannon! 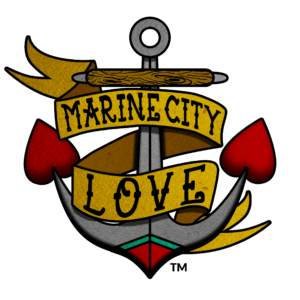 Donna LOVES Marine City because it has such a big heart! We LOVE that YOU have such a big heart, Donna! Betty, Kim, and Reese LOVE Marine City because they enjoy going antiquing! Marine City LOVES you back! I LOVE how the town supports the local high school sports, drama and band programs! LOVE the parades, the events and how everyone rallies to participate!